The national department of talim of Jamaat-e-Ahmadiyya Canada organised its 5th Annual Holy Quran and Science Conference on Sunday, 25 November 2018 at Baitul Hamd Mosque in Mississauga. 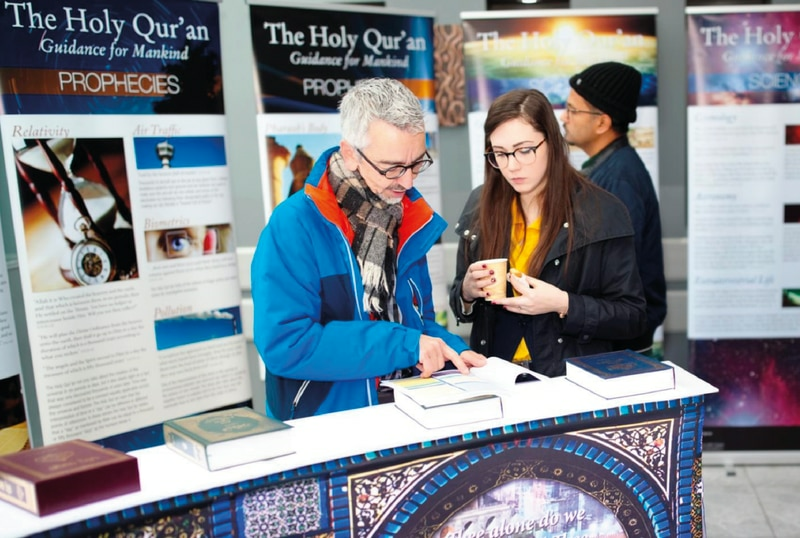 The Holy Quran and Science Conference highlights novel research carried out on the Holy Quran to discover the treasures buried in the Holy Book of Muslims. The wide range of subjects that were covered included physics, chemistry, biology, astronomy, medicine & health sciences, engineering, as well as other areas of research. The conference proceedings were divided into four sessions. At the end of each session a panel discussion with questions from the audience was arranged. By the grace of Allah, this year, over 400 people from all walks of life participated in the conference. In addition, 2,500 people benefited from the web-stream of the conference proceedings. Many non-Ahmadi guests also attended the conference. There were a total of 22 oral presentations and 4 poster presentations. Presenters came from UK, USA and Canada. The first session chaired by Professor Dr Sohail Z Husain started at 10:15am with the recitation of the Holy Quran and English translation. The session chair then explained briefly the guidelines for presenters. This was followed by the opening remarks by Farhan Khokhar Sahib (Naib Amir Jamaat Canada). He stated that Holy Quran draws attention of the believer to the creation of the heavens and the earth as a sign for those who ponder. He further said that it is through the scientific knowledge that people know their Creator and this is a noble journey. The second session was chaired by respected Dr Zahid Khan Sahib who came from UK. The fourth session was chaired by Lal Khan Malik Sahib, National Amir Jamaat Canada and co-chaired by Dr Hameed Mirza, national secretary talim. In the closing session, Dr Hameed Mirza, Conference Chair thanked the audience, presenters and volunteers for their hard work and dedication. Dr Mirza stated that it was now time that we pondered on the deeper meaning of the Holy Quran and sought guidance for our research work. Ahmadi students and researchers should look into developing research projects based on ideas from the Holy Quran and work to show this face of the Holy Quran to the rest of the world. Then, Mubarak Nazir Sahib addressed attendees and reminded them that only one Dr Abdus Salam is not enough. We should work hard to become like him. At the end, Malik Lal Khan Sahib, Amir Jamaat Canada said that he felt that justice was not being done to the study of the Holy Quran. Many a time, one reads the Quran and a thought arises in our minds, but true research was the manner in which the presentations had been prepared and delivered.